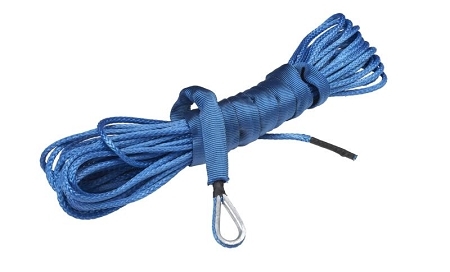 Heavy duty 3/16 x 50' replacement synthetic winch rope. Universal applications to fit most ATV and UTV winches. U.S. made AmSteel®-Synthetic fiber rope has a higher breaking strength than that of steel cable but weighs far less. It won't bind up or develop those sharp frays that give nasty slivers. It doesn't conduct electricity or heat, so it won't freeze your hands in winter. It won't rust, doesn't kink, doesn't recoil, and doesn't stretch. It is a MUST HAVE for any serious off-road riders! AmSteel®-Blue has a patented coating called Samthane which protects the cable from damage - so its critical to get the AmSteel®-Blue brand - other brands do not have this coating. 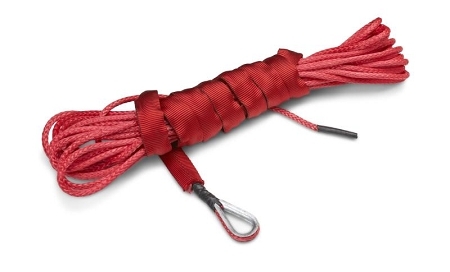 Perfect for all your winching needs! 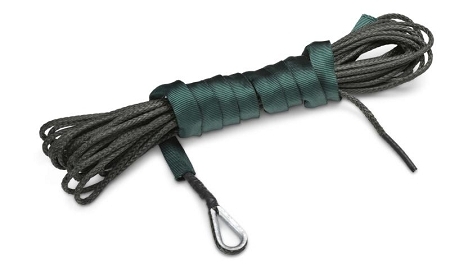 An aluminum hawse fairlead should be used with synthetic cable - NOT a roller fairlead.